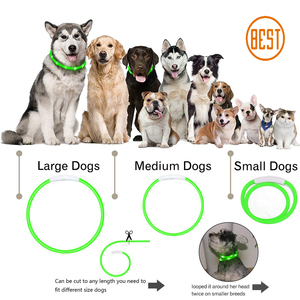 5 YRS Shenzhen Jk-Luxuries Pet Product Co., Ltd.
9 YRS Yiwu Lisen Plastic Products Co., Ltd.
8 YRS Zhejiang Pujiang Sanlian Chain Co., Ltd.
Q: Can we order the personalize led pet collar with special logo9 A: Of course,it's Okay! If bulk production,blister card for packaging or as your request. Q: How to pay Ecostar9 A: Small order,Paypal & Western Union are okay. 2 YRS Kolida Technology (Shenzhen) Co., Ltd.
About the size The CF9 silicon LED necklace can be cuttable and any size you need, you can cauculate your doggies or your children's neck size and cut it to the size your need, easy to assemble. About the charging The CF9 led silicon band can be rechargable by any micro usb line, such as your mobile phone line. The charging time is about 2 hours, and using time is about 8-10 hours. Reason 4 Steady production and sales- two containers at least to ship abroad each day. Reason 5 Highly evaluated by our main customers like Trixie, Iris and Jago etc. Reason 8 Uncompromised execution of great service concept - to treat customers as friends. 11 YRS Dongguan Shenghong Webbing Tech Co., Ltd.
B: Mass production shipping time: based on the order quantity. We dedicated in design, development, production and sales of EL products. Lastly We arrange the production and ship it to you after finish. Alibaba.com offers 295 flash dog necklace products. About 16% of these are pet collars & leashes, 1% are metal crafts. A wide variety of flash dog necklace options are available to you, such as free samples, paid samples. There are 295 flash dog necklace suppliers, mainly located in Asia. The top supplying country is China (Mainland), which supply 100% of flash dog necklace respectively. Flash dog necklace products are most popular in North America, Western Europe, and South America. You can ensure product safety by selecting from certified suppliers, including 42 with ISO9001, 6 with BSCI, and 4 with Other certification.